We’ve got some great plans to make your DIY Valentine’s day crafts a huge hit in your home. You won’t need to fill your holiday with only sugary sweets, now you can fill them with science too! Don’t worry, while all of our science is the real deal, it is also fun, and we have a TON of YouTube videos to help you through the process. Watch Dr. Erica as she makes each of the projects, answering questions you may have as she goes along. Each of the projects has a downloadable template that is free, yes, FREE! 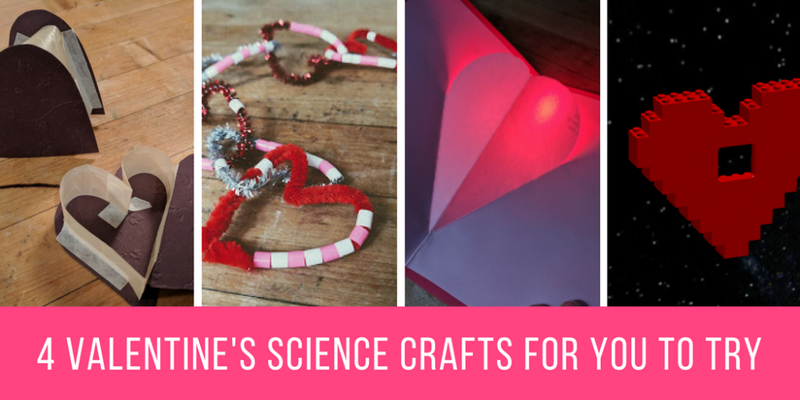 So make sure you click on the links to get to each of these cool Valentine’s day crafts, then subscribe to our newsletter to get all the good info as if comes out! Create a geeky Valentine’s craft decoration (or necklace?) as you learn how to speak the language of computers: binary. This activity has a lot of learning, from learning binary to the fine motor movements of stringing on each bead. I absolutely adore these DIY Valentine’s cards. Our free downloadable template has two options, a regular popup heart that has an LED, or a beating heart, which is also a popup heart, but instead of a single ON/OFF pressure switch it has a sliding switch that allows the LED to “beat”. It might seem daunting, but our videos will help you master paper circuits of all types, including this one! I love an engineering challenge, and this one has a direct use. Not to say that spaghetti bridges aren’t fantastic engineering challenges – they are. But having the result have to fit specific needs that will actually be used can be a huge motivator for kids. In this Valentine’s day craft, they will engineer a heart-shaped box to gift candy in! This is a new spin on DIY Valentine’s – heart-shaped Lego puzzles. In this set of six Lego puzzles, kids will try to recreate the image with their own building blocks – a sort of spin on tangrams. Kids will enjoy trying to create a Valentine’s day photo frame from their box of bricks!